Lovastatin became the first statin to be approved by the FDA in 1987. 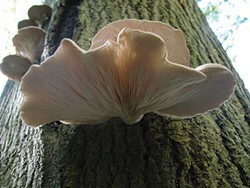 It had been discovered 15 years earlier in oyster mushrooms like these. Today's subject, let's call him Patient B, is a 72-year-old Caucasian male presenting no symptoms (non-smoker, no medications, not diabetic, no history of cardiovascular problems, elevated but "well-controlled-for-his-age" blood pressure, doing moderate daily exercise). He's trying to decide whether to take daily statins to lower his cholesterol count, which breaks down to: total 231 (standard range 100-199); "bad" LDL 149 (standard 0-99); "good" HDL 63 (over 39 — the higher the better). Statins, which inhibit the body from synthesizing cholesterol, would reduce his LDL and total cholesterol levels to acceptable levels at a cost of just $4 per month for a daily dose. Statins appear to have little downside. Some people do experience harmful side effects, such as muscle pain and — less commonly — liver damage and digestive problems, but most of these potential users can be weeded out in advance; e.g. if you're a heavy drinker, don't take them. When our subject enters his information into the AHA online calculator, he discovers he has a 24 percent risk of having a heart attack or stroke over the next 10 years (i.e. on average, for every 100 people, 24 will have such events). He notes that optimal numbers (170 total cholesterol and 50 LDL cholesterol, 110 systolic blood pressure) would halve his risk. Hoping to get closer to optimal values, he elects to take a generic statin (lovastatin 20 mg) for a year, then re-test. By way of rather obvious disclaimer, Patient B is an engineer, not a doctor, so (duh) talk to your physician before doing anything, and take the above with a grain of salt — but no more; too much salt is bad for your blood pressure. Barry Evans (barryevans9@yahoo.com) also worries that his Field Notes anthologies are getting lonely at Northtown Books, Eureka Books and Booklegger.